The project has established a pro-active alliance of local authorities, non-government organisations & farmers to restore local river banks & to re-establish natural habitats, overrun by invasive weeds & eroded by years of cattle grazing. Green tourism has grown over the last decade in the Ourthe region of Wallonia, thanks to the great diversity of farming, natural landscapes, biodiversity and tourist attractions. The river basin attracts fishing, hiking, cycling & other countryside leisure enthusiasts. To ensure a sustainable future, active management of vegetation and landscapes, including the river banks and watercourses is needed, to balance the different uses of the river and surrounding countryside. 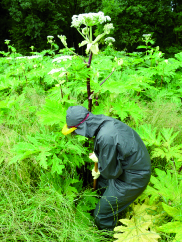 The objectives of the project include: Development of partnerships between local stakeholders to ensure the sustainable management & maintenance of river banks and watercourses; Raising awareness of environmental protection needs and to promote direct actions; Restoring and preserving river banks and the biodiversity in the region, particularly through control of invasive plant species (Himalayan Balsam & Giant Hogweed). Results include: 16 agreements signed with farmers, 30 troughs installed, 3000 metres of fences installed and 850 metres of banks reforested, 283 kilometres of banks freed from invasive species including eradication of Himalayan Balsam and Giant Hogweed on the whole territory; raising awareness of envirnmental sustainability amongst all stakeholders; improving biodiversity on all the banks of the river Ourthe; dissemination of information on the project provided to other Walloon regions. The collaboration between the various actors has proved very efficient and effective. A technical committee has allowed careful monitoring of the project, allowing coordination of activities across the whole territory & also enabled the necessary budgets to be secured to organize the campaign and sub-contracts required to combat the invasive species, construct fences & secure agreements between farmers and other local stakeholders.